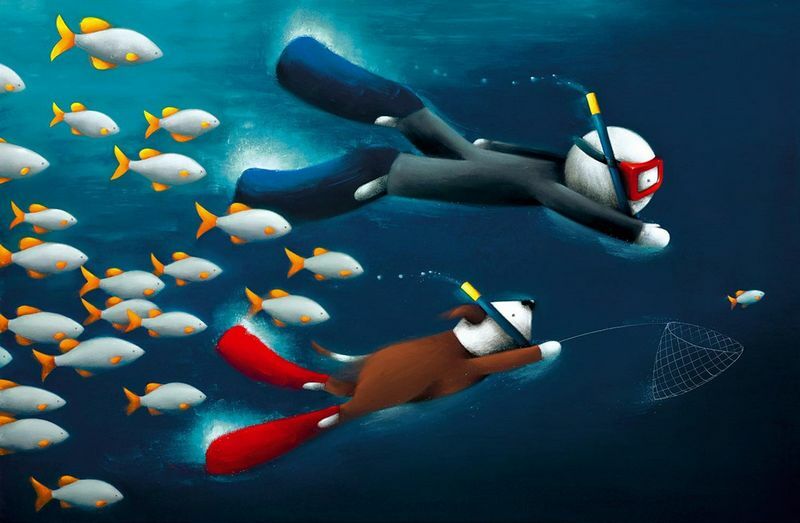 Finding The One - mounted by Doug Hyde // £459.60. In a new type of adventure for our heroes, one of Doug's human characters and the brown and white dog go underwater, snorkelling in search of a magical fish! We join our heroes just before the dog manages to catch the little guy with his net but they are being closely followed by twenty or so ‘fishy’ friends! The background of the painting is a rich dark blue, interspersed with splashes of white to show movement around their hands & feet and lush shades of aqua blue reveal the shallow parts of the water. The school of fish are also an eye catching light blue, with almost fluorescent orange fins and tails! All in all, Doug has chosen paints that blend amazingly well and they sit brilliantly with the red of the dogs fins (feet) and the man's goggles. What is your favourite colour Doug has used here? Mine is the dash of yellow used on the tops of the snorkels, it looks almost neon!